We know how critical it is for you to have collaborators on your guides – but also how tough it can sometimes be to keep track of which changes were made, by whom. Activity History eliminates that problem. You can now view any edits made to all the guides you have access to. You can find it no matter where you are in Builder – just tap on the “Activity” icon in the header. If you’d like to see activity for a specific guide, simply navigate to that guide’s dashboard. Actions are timestamped so you know when they occurred. If you are an organization administrator and want to see all the activity for your org, you can navigate to your organization dashboard. 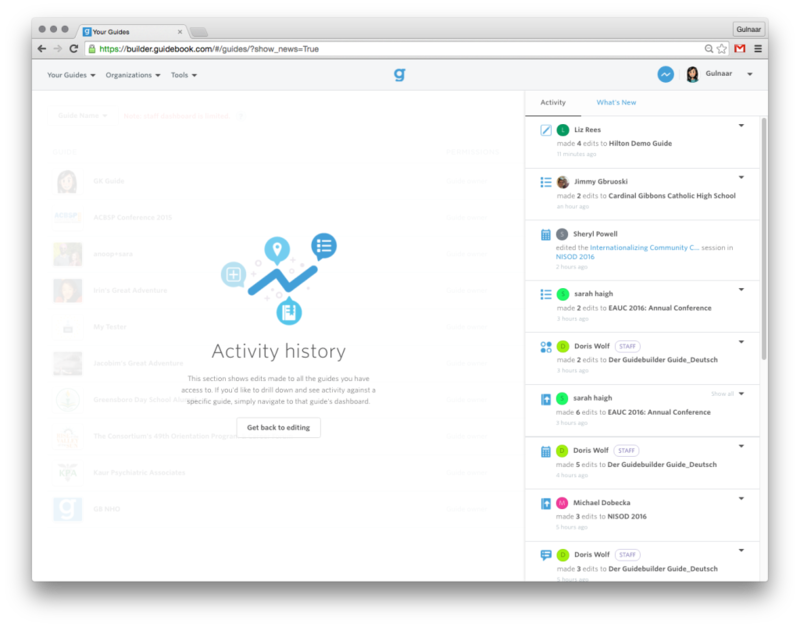 From Activity History, you can jump to the recently edited or added item by clicking directly on the link. We’ve also made it easier for you to learn about the latest Guidebook updates. Tap on “What’s New” to view recent feature releases. We hope that this feed allows you to collaborate more smoothly with all contributors to your guide! Check it out in your guides now. If you have any questions or feedback, please reach out to us at support@guidebook.com.